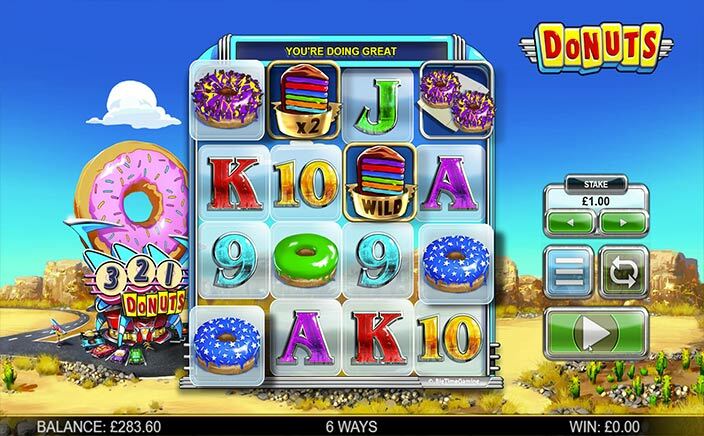 Donuts is a slot designed by Big Time Gaming having 4 reels and 4,900 ways in which you can win. A grid of dimensions 4×4 is used for playing it and the boxes present in here can reveal some lucrative multipliers. The beautiful design will give you an American feel. The betting range begins at 5p and goes up to £10 for every spin. The reels have a background of a desert highway that has a huge Donut diner on either side. Playing card symbols from A to 9 are the low-paying symbols and the high-paying ones are four bright donuts. The highest paying symbol is the yellow and the purple coloured donut as you will be paid 15x the stake on landing either of them. A wild symbol is also present which can show up on reels four and two only. The wild can replace all the symbols except for the scatter symbol. 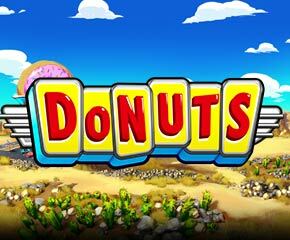 A box can land randomly on any spin and as it lands, it will open up revealing the four of the same donut symbol or even multiplier wild symbols. These multiplier wilds or donut symbols can boost up the payouts by 4x or 2x if they show up in any winning combo. In order to trigger the bonus feature, three or four golden coloured scatter symbols need to be landed which will then in turn award free spins up to 12-20. Before the free spins come into play, the Bonus Countdown will be played on a new reel set which comprises only golden donuts and blanks. You will begin by activating the scatter symbols that have a 1x multiplier attached to it. After that reels will spin three times, the donut will be held in its place after it lands and the response will get reset to three. This countdown will keep on continuing until a donut is landed. Donuts has much of hit and middle affair side to it. There is madcap and frantic feel to it which you will enjoy. Once the multipliers begin their action, you can end up grabbing some yummy and tasty wins as well. The highly volatile slot can fetch a win worth 40,000 times the stake on each spin. Donuts is worth checking out if you are looking for something unusual.